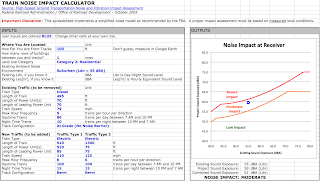 UPDATE: noise calculator spreadsheet is now available in both .xls (Excel 2003) and .xlsx (Excel 2007) formats. The generation, propagation and perception of noise is one of those fields where concepts are deceptively simple and yet devilishly complex. Anybody can buy a sound level meter at Radio Shack, but that doesn't make one a noise expert any more than buying a calculator makes one a math whiz. Thankfully, the FRA publishes a well-written guidebook on High-Speed Ground Transportation Noise and Vibration Impact Assessment that describes a standard methodology for determining noise impacts from new high-speed rail projects. While this guidebook was published in 2005, the physical laws of acoustics remain the same as always. Despite citing the FRA guidebook, there is little evidence in the CHSRA's program-level EIR noise and vibration chapter and its appendices that the source-path-receiver model framework described in the handbook has actually been applied. Impacts are broadly classified as high, medium or low, and crudely bumped down by one level on the peninsula (from "high" to "medium") because horn noise would be eliminated from more than 40 grade crossings. 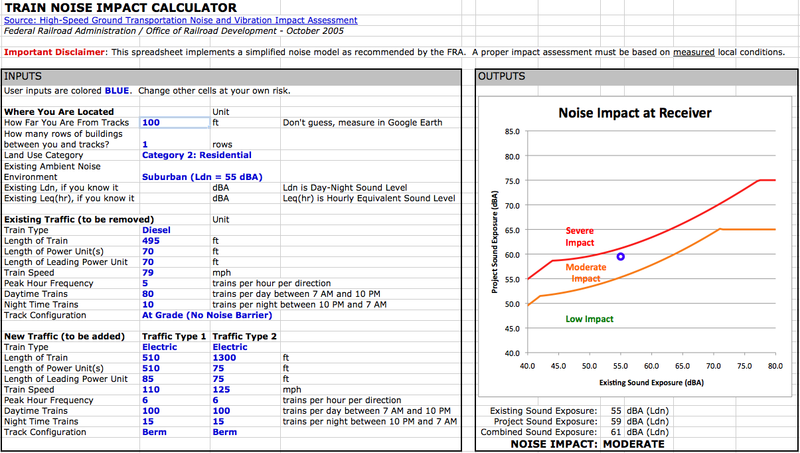 To make the issue of noise impacts more accessible to the layperson, an implementation of the FRA noise impact assessment model is provided in the form of a train noise calculator spreadsheet (45 kB Excel 2007 .xlsx file or 140 kB Excel 2003 .xls file, no macros, made virus-free on a Mac.) Before playing with this, it's probably best to study up on the basics of noise in the FRA guidebook as well as CARRD's compilation on noise pollution to tell your dBA's from your Ldn's. The spreadsheet also implements a twist for the peninsula: the HSR project would not only add high-speed trains but also replace diesel Caltrain with somewhat quieter electric trains. The spreadsheet calculates the effect of the substitution of one type of traffic for another, and accounts for some unusual scenarios where the HSR project may generate less noise than the existing at-grade, diesel Caltrain. Elevated viaducts, as currently proposed, are twice as loud (+9 dBA) as elevated berms at the train speeds envisioned on the peninsula, everything else being equal. Viaducts amplify rolling noise because they are hollow structures that act as a resonating chamber. Belmont and San Carlos might be well-advised to leave their berms as they are. At-grade tracks can be made half as loud (-10 dBA) with a noise barrier, when train speeds are in the 100 - 125 mph range proposed for the peninsula. Noise barriers become less effective as train speed increases and noise becomes dominated by aerodynamics, but here on the peninsula, they would probably do just fine. Trenches are extremely effective at shielding train noise; they are overkill as far as noise mitigation is concerned. With a trench, even very high levels of traffic (several hundred trains a day) would create less noise than Caltrain does today. The trench need not even be covered for this benefit to be realized. The proximity to an existing grade crossing with horns has a significant effect on the severity of the impact from the HSR project, as pointed out in the EIR noise chapter. A suburban residence within 500 ft of a grade crossing experiences ambient sound levels twice as loud (+10 dBA) than a suburban residence located away from grade crossings with horns. Since the existing noise level is the basis against which the noise added by the project is evaluated, areas near grade crossings can be expected to rate a lower impact. Nevertheless, not all areas along the peninsula corridor are close to a grade crossing. Not surprisingly, Caltrain's fantasy schedule (10 tph peak, 162 trains/day) combined with HSR's fantasy schedule (10 tph peak, 6 tph off-peak, 228 trains/day) results in ~5 dBA worse noise impacts than a more realistic traffic level of 6 tph Caltrain and 4 tph HSR. Out in the central valley, urban areas with ~150 trains/day blasting at 220 mph on concrete viaducts would experience severe noise impact within ~500 feet on either side of the tracks. Suburban and rural areas would experience even wider areas of noise blight, especially if the tracks are built on viaducts. 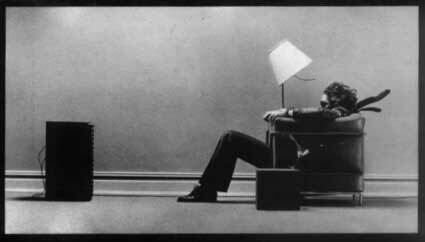 Noise is one issue; its evil twin, ground-borne vibration, is a subject for another day. In the meantime, suggested improvements to the train noise calculator spreadsheet are most welcome. Facing a catastrophic shortfall in its operating budget for fiscal year 2012, Caltrain needs every ounce of good will it can get from peninsula communities in order to survive as a service and as a bureaucratic entity. All this talk of 80-foot wide viaducts tearing through residential neighborhoods is not helping one bit. Caltrain's electrification project, cast for years as the key to future improvements in the system's operating bottom line, is being held hostage by (a) uncertainty over the proper phasing of the electrification project with respect to HSR construction, (b) threats of lawsuits over a somewhat stale EIR that tiptoes around the HSR issue, and (c) the funding package unraveling at the seams, on the widely held but mistaken expectation that HSR will pick up the tab. Caltrain's $230 million reinvent-the-wheel PTC science project, mandated by the FRA as a sine qua non pre-condition to electric operation, has gone out to bid on a wing and a prayer with no clear source of funding identified other than the remote chance that the peninsula HSR project might receive the entire federal grant allocated for the statewide HSR system. Caltrain's own guy, Bob "Father of the Baby Bullet" Doty, propelled into the driver's seat of the joint Caltrain - CHSRA Peninsula Rail Program, valiantly ran interference with peninsula communities, and must now be wondering if the steering wheel really is connected to the wheels of this particular bus. The surest sign of a thorny situation is that stakeholders keep calling for the project to be "done right," the touchstone platitude that is always trotted out when people start to get hot under the collar. Another recurring buzzword is "reset button." Californians for High Speed Rail wants to hit one reset button. Congresswoman Anna Eshoo wants to hit another reset button. What about hitting a big red reset button at the Caltrain bunker in San Carlos? Ditch the weak operating plan proposed as part of Caltrain 2025, and plan for smoking-hot corridor operations. A clockface timetable with a mid-line standing overtake, more than any other Caltrain improvement, promises to increase revenue while keeping operating costs under control, because it requires fewer trains and fewer crews to operate a service that will make the Baby Bullet look like a Model T.
Phase the quadruple tracking for HSR and start by building a modest four-track mid-line overtake facility from Redwood Junction to just south of downtown San Mateo. This avoids most of the NIMBY controversy while delivering the highest possible corridor throughput for Caltrain express service as well as the initial HSR services. Ditch CBOSS and specify an off-the-shelf PTC standard that can be expanded to the statewide HSR system. Such a system already exists, and is mentioned dozens of times throughout the CHSRA's system requirements with the contractually-delicate phrasing "The CHSTP train control system will demonstrate Functional and Technical Requirements similar to ERTMS but the System Requirements are being written without specifying an ERTMS system. It is accepted that an ERTMS system may eventually be proposed and accepted." Bonus: HSR funds might pay for Caltrain's PTC. Address the issue of level boarding once and for all. To make the most efficient use of San Francisco's new Transbay Transit Center, it is crucial that Caltrain and the HSR system adopt a common platform interface. The mantra ought to be "any train, any track, any platform". So far, there is not a peep from Caltrain. While it can't be confirmed, the reset button is possibly located right under Mike Scanlon's desk. The Belmont City Council is crafting a resolution (see original draft, and revised draft to be considered on 9/14) supporting the reinstatement of a cut-and-cover trench option for the high-speed rail authority's San Francisco - San Jose Draft Project EIR. Underground tracks, favored by the city, were dropped from further consideration when the CHSRA published its Supplemental Alternatives Analysis on August 5th. 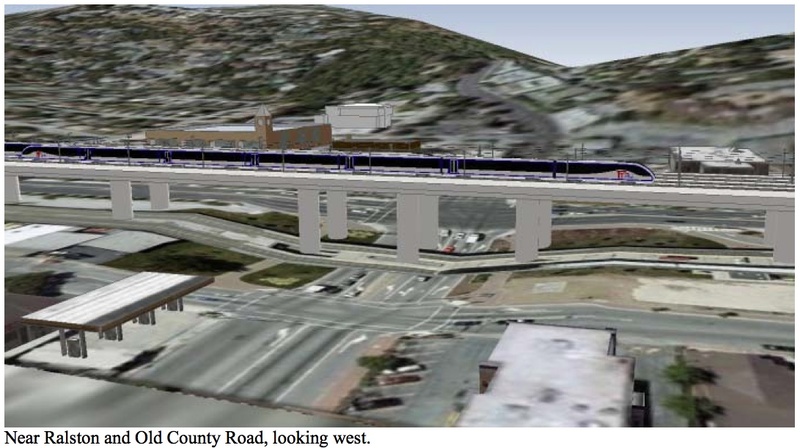 That action left Belmont (and neighboring San Carlos) with only a single option to be carried forward for further study in the EIR: a tall viaduct. This viaduct is featured in crude renderings and a YouTube video posted by the city. Belmont is the only member of the Peninsula Cities Consortium that did not have a trench or below-grade option carried forward for detailed study in the EIR, which has city officials fuming. The Supplemental AA has caused quite an uproar on the peninsula, especially in the member cities of the PCC, largely because of the vertical alignment options proposed for the four-track corridor. The vertical alignment may need to be changed, requiring either raised or lowered tracks, in order to eliminate about 45 grade crossings along the peninsula corridor that would otherwise have to be closed. These changes are necessary because the California Public Utilities Commission, which regulates grade crossings and pursues a stated policy of reducing the number of such crossings, is exceedingly unlikely to allow four-track grade crossings, much less in a dense suburban environment, regardless of train type or train speed. One might reasonably assume, then, that the range of vertical options feasible for Belmont would depend solely on the locations and constraints imposed by the grade crossings that currently exist in Belmont. The trouble with this assumption is that the number of grade crossings in Belmont is... Zero. The existing tracks run through Belmont on a retained fill embankment (shown in photo at left, and known in some quarters as a Berlin Wall) over Harbor Blvd and Ralston Ave. These grade separations were built starting in 1996, opened in October 1999, and did not cut off any pre-existing (legal) access across the tracks. The berm is now perceived as a community division, and prompted the official request to study design options that would enable its removal. The Belmont viaduct is an example of the Context Sensitive Solutions process producing an unwanted outcome. From its very first scoping comments, Belmont expressed misgivings about the berm and requested enhanced connectivity and mobility, in the hope of obtaining a tunnel paid for with OPM (Other People's Money). Taking into account the feedback provided by the Policy and Technical Working Groups at a series of meetings attended by Belmont officials, the Supplemental Analysis Report substituted a tall viaduct for the existing berm because "the Berm option does not enhance connectivity and mobility as well as an aerial viaduct option." If Belmont disagrees with this outcome, if the city believes the viaduct is not better than a berm, and if this business about connectivity and mobility was all just a colossal misunderstanding, then the berm will simply be expanded to four tracks. The berm is a "fact on the ground" and its visual impact, once all is said, done and litigated, will not be counted against the high-speed rail project. That is the likely outcome if Belmont becomes any more strident in its demands for a tunnel.